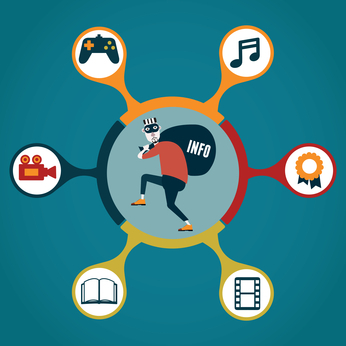 Stop online content thieves with free legal advice UK. In the first of this 3 part series about how to stop people stealing your online content, we will look at how you can identify content theft before in part 2 looking at what you can do to prevent content theft going forwards and finally turning to what steps you can take when someone has stolen your online content in part 3. Content is king and these days any business who wants to go places puts an awful lot of time and effort into producing quality content. So it is particularly galling when one of your competitors comes along and rips off your last blog post that you spent hours putting together. Well there are certain things you can do immediately to check on content that is already out there and whether it is infringing your copyright in any way. Search on Google (or your search engine of choice) for a statistically improbably phrase that is only likely to appear in your content – about 6 to 12 words should be about right. then you need to click the link and repeat the search. This means, quite literally, other pages on the Web have content almost identical content to your own and you definitely need to follow up. 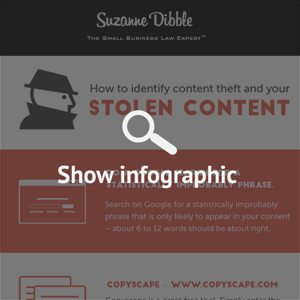 While it could be another page on your site, it could also be someone who has stolen your content. If you are searching for images, you can right click on your image and click on ‘copy image location’ or ‘copy image address’ (of if you are using Internet Explorer just click on properties) and then search for that copied image location. On your google search click on ‘search by image’ and the results will bring up a list of images and where they are being used. Plagium checks for duplicate content in a similar way to Copyscape but it can also scan news sites and social networks. You can also adjust the algorithm to make it stricter or more relaxed. Plagium is free but donations are accepted. To check whether someone has stolen your images, what you need is a way to perform a reverse image search – where a smart search engine looks for a photo by detecting identical content within the image itself, rather than keying in file names or metadata (as these are easily changed). To use TinEye, you can upload a photo from your computer or point to a Web page that already hosts the photo. TinEye then returns a list of sites using the same image. TinEye isn’t a perfect solution – it often identifies photos that are similar to, but not exactly the same as, the source image. And its database of photos represents only a tiny part of what’s available on the internet, so if you do get zero results, that doesn’t necessarily mean your image isn’t being used out there somewhere. The new-ish Bing search engine lets you hone in on “similar” images when doing an image search. This can lead you to images that are being used on multiple sites. All you have to do is go www.bing.com and click on images, then search for a photo. When you see the results, hover over an image that interests you. Click “Show similar images,” and Bing will show results that might contain the same image on a different site. This has it’s own problems in that you can’t start with a specific photo, you have to use the right search terms instead. And once you find your image, finding infringing images is still far from a sure thing. So that should be enough to get you started with. In the next part we will look at what you can do when publishing your content on the net to prevent it being stolen and finally in part 3 we will look at what you can do about it, including how to force the infringer to take down your content. Disclaimer: The information contained above is based on English law only and is provided for information purposes only. The contents of this article are not intended to amount to advice and you should not rely on any of the contents of this article. Professional advice should be obtained before taking or refraining from taking any action as a result of the above contents. Suzanne disclaims all liability and responsibility arising from any reliance placed on any of the contents of this article.